In 2009 James Cameron’s Avatar was released in theaters, blowing audiences away. The film remains one of the highest grossing films of all time. Cameron now has plans to bring three more Avatar films to light, and as those go into production Dark Horse Comics is getting in on the action. 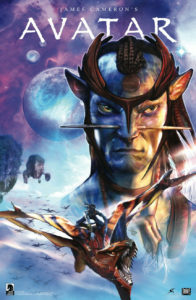 During a panel at this year’s New York Comic Con, Dark Horse announced that they will be publishing Avatar comic books. While Cameron couldn’t make the announcement in person, he did provide a video for the panel announcing the partnership. In collaboration with Cameron’s film production company, Lightstorm Entertainment, Dark Horse’s Avatar comics will feature “new story lines from the past, present, and the future world of Avatar,” according to Cameron. While the sequel to Avatar is expected to hit theaters in 2017, the official release date for Dark Horse’s first issue of Avatar has yet to be revealed. Are you looking forward to reading comics set within the Avatar universe? Check out James Cameron’s official announcement video below and feel free to let us know what you think in the comments.